See http://www.bbc.co.uk/programmes/p015vkbl/features/programmes for more information. I will be reviewing them for those of you who miss them. Thank you for this. I was happily going about my business and thinking about what episode I got to yesterday on s2 of the Tudors and to carry on tonight and forgot about BBC2’s programme at 9pm. At least now I’ll remember to tune in! Not unless BBC America show it. Perhaps they’ll put clips on YouTube. I don’t know, sorry. BBC iPlayer cannot be viewed from outside the UK, though, unfortunately, unless you use reroute through a UK server. I have to ask — is that woman supposed to be wearing a French hood? It looks really … aggressive for a French hood but I can’t think what else it would be. Yes, all the documentaries, movies and series seem to have hoods that stand up, rather than being fitted close to the head like the ones you see in portraits and on effigies. It is the correct show. For those who are in the states click the link in my comment above. I wont be able to see any of the above. If anyone sees that they will be on you tube or even bettter on DVD please post. Sometimes living in MN really stinks!!!! Found the Last Days of Anne Boleyn absolutely fascinating and very varied opinion as to who or what led to her downfall and execution. I cannot believe it was just Thomas Cromwell who woke up one day and decided that Anne stood in the way of his foreign policy and so she had to go or Henry decided he wanted him to invent a way to get rid of her. That seems too simple. Nor do I subscribe to the complex conspiracy theory either. I think it was a series of things that just accumulated in all those who wanted to get rid of her coming together to bring her down. The time had to be right and from 18th April 1536 this seems to have been the case. Various singles seem to have been picked up in and small plots put into action. Then, Anne herself seems to have accidently done or said something that set the whole thing into swift motion. 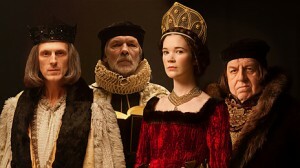 Rumours about her behaviour came out and Thomas Cromwell as the right man for the job was asked to investigate further. The 1534 Treason Act had put a mechanism in place to protect Anne and Henry from any slander against their persons or those of their heirs to the throne. So you could not just float around the court and say after a few drinks that you thought the Queen was having an affair with her musician. The rumours that must have been brought to the Kings attention by a member of the Council or someone else in the royal household, with an insiders ear; someone with enough influence that Henry would listen to him, and as part of general inquiry, Cromwell given a warrant to investigate any allegations with the hope that the Queen would be cleared. All of this was suggested this evening, but it is the way I believe it all came about. It is not clear that Henry wanted out of the marriage at this point. It was five months since the miscarriage at the end of January 1536 and he had calmed down. In fact his relationship with Anne seems to have been positive, although Anne felt herself to be insecure and was acting oddly. She had severe mood swings. Henry may just be one of those men who once he gets his feet under the table is too comfortable to do anything about it when the situation changes. He may have felt comfortable enough to see how things went with Anne for a time before making a decision about the marriage. But there are theories and some evidence to suggest that Henry was falling deeper in love with Jane Seymour at this time and that leading courtiers,including Cromwell were coming over to her side as a possible replacement for Anne. Henry may have been in two minds. On one side he is insisting on Anne being recognised as Queen. On the other he is courting Jane and begins to look into rumours about the Queen. Is one a smokescreen for the other or are they just coincidences that one follows the other. You know, one of those nasty bombshells just when life seems to be going well that puts you out of kilter. Whatever the reasons why Anne suddenly finds her world falling down around her and all these investigations start to show up stuff in the eyes of Cromwell who digs deeper and deeper; it all happened very quickly, within the space of about two weeks. And when the Tudors put the whole thing into just one episode it was frightening! The so called evidence seems to come in a head rush as the ladies of the Queens chambers are brought in and asked about her relationships with various gentlemen as a result of the interrogation of Mark Smeaton. Mark confessed to four accounts of adultery with the Queen and named at least two of the other gentlemen, the ladies certainly confirm the names, and may have named the missing two. All five men are members of the Boleyn faction at court and so are also a danger to anyone who wants to replace Anne with another Queen. No wonder some of the historians tonight went for the conspiracy. I notice no matter how much I read you never really get to know who was in on this so called conspiracy. There are some obvious candidates. Sir Anthony Brown, brother of the Queens first accuser Elizabeth, Countess of Worcester, and involved in the Queens trial and investigation. Thomas Cromwell; our chief of police for want of a better description of his role in all of this; or should I say secret police; now looking to support Jane after he has fallen out with Queen Anne; Sir Nicholas Carewe the bold jousting partner of the younger king Henry and a strong supporter of Princess Mary and off course the Dukes of Suffolk and Norfolk; but there is actually no real evidence to point to either having a role in Anne’s downfall. Both, however, have been critical of Anne’s marriage to Henry, and have watched and waited for her to make a mess of things, especially Suffolk. Both will be her judges at her trial, although Norfolk was distressed and may have believed she was innocent. Suffolk was probably delighted. Even without any other leading players, this group make a powerful faction, and backed by the Imperial Ambassador, the changing foreign policy of the King and the attitude of Spain, and with firm links to the Seymour families; are enough to bring Anne down. That does not mean that this is what happened; it just says that they saw an opportunity to get at her, joined forces and brought events to a head. The rumours, the accusations and a suspicious court atmosphere did the rest. Great to hear tonight all of the main theories and the main historians, plus two novel writers, H Mantel and P Gregory, bringing their ideas and research to give us an insight into what happened during those last six weeks of Anne’s remarkable life. There were quotations and references to many documents and obscure sources that I was not familiar with, such as Snipe’s sermon, which I had heard something about most recently, but not thought of as an obvious piece of evidence before in the case against Anne Boleyn. It just goes to show that you should look at a really broad range of contemporary documents, even obscure ones like sermons for clues to what is going on in the lives of historical people. Loved all of the differing opinions, even enjoyed having a different approach in Professor Bernard, and who knows, there may indeed be no smoke without fire. I doubt it, but when looking at something and analyzing lives and theories you have to look at counter arguments as well, and be prepared to debate. Cannot wait to see what the episode on Thomas Cromwell has to say. Saw a slight preview and I am not sure about the nice guy Cromwell; but he was called the widow’s helper. The entire “Last Days of Anne Boleyn” is on youtube already! WOW. Sorry I can’t provide the link with this device. Just google it as youtube the Last Days of Anne Boleyn documentary. It’s pretty good although they needed to dress poor Anne in more than one gown. Certainly presented a diversity of viewpoints. Do post a review Claire.